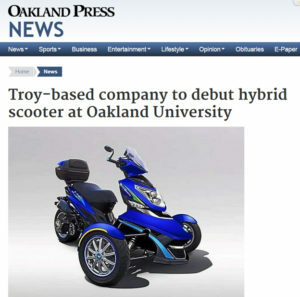 A Troy-based company is expected to unveil a prototype for its 100-mile-per-gallon hybrid scooter Thursday, April 16 at Oakland University. 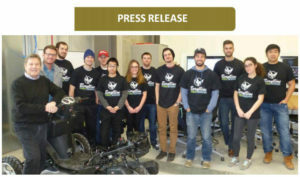 Oakland University students collaborated on marketing research for the 150cc F2A model to be released by the Berylline Corporation. When people think of hybrid vehicles, they usually picture cars — maybe heavy trucks and buses. 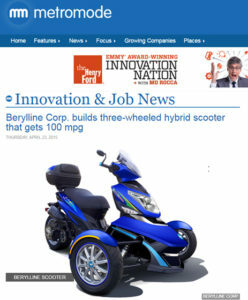 Berylline Corp. “We saw there was a void in the (hybrid vehicle) market for a scooter, a three-wheeled trike,” says Dennis Dresser, president of Berylline Corp.
Troy-based Berylline Co. will introduce a 100-mile-per-gallon hybrid scooter today on the campus of Oakland University, giving riders more transportation options in the resort and leisure vehicle market. 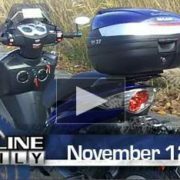 In the floor, where you have the battery set up, we have attached a lithium ion battery that weights six pounds,” Dresser says. 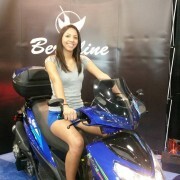 “It can be pulled out and recharged into your home, on your typical 120-volt socket. 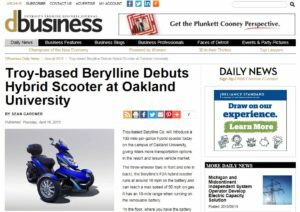 ROCHESTER HILLS — A new hybrid scooter — developed with help from Oakland University market research students — aims to bridge the gap between golf carts and motorcycles for retired baby boomers. OU INC has been awarded an additional $16,500 in Business Accelerator Funds (BAF) from the State of Michigan to provide accelerator services to its client company Berylline, bringing the Berylline BAF award total to $43,600. 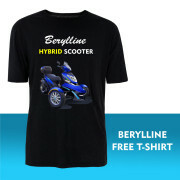 Berylline has developed the F2A, a unique, three-wheel, hybrid scooter for personal transportation. 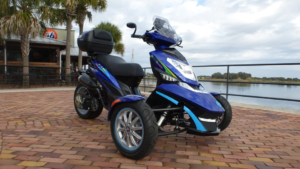 This plug-in hybrid electric vehicle (PHEV) is powered by a combination of gas and electric motors and is safe, stable, and fun to ride. 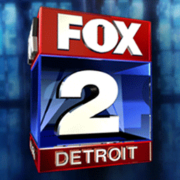 It is intended for urban areas and local communities, with a top speed of approximately 60 mph. 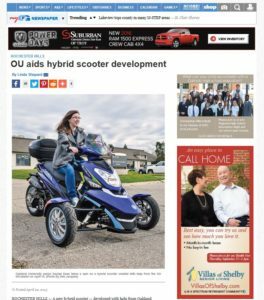 OU INC clients, Berylline, Corp., Wave Water Works, Inc. and Na4B, LLC, have engaged with students in the School of Engineering and Computer Science senior design engineering lab through OU INC’s innovative Academic Integration Program.